An Ellington resident raised in East Windsor, Representative Christopher Davis was first elected to the Connecticut General Assembly in 2010 to represent both communities in the 57th District. Rep. Davis currently serves as the Ranking Member of the Finance, Revenue and Bonding Committee. He also serves on the Housing and Energy & Technology Committees. Rep. Davis has worked tirelessly on behalf of his constituents for fiscal responsibility in state government, advocating for reduced spending, limited taxation, and reductions in our state’s debt obligations. Additionally, Representative Davis also was recognized for his advocacy for education and employment opportunities for young adults in Connecticut. Representative Davis has also distinguished himself as a strong advocate for job creators in Connecticut, conducting numerous business tours throughout the district and forming a Business Advisory Council to maintain a dialogue with employers in the 57th District. Representative Davis also actively seeks his constituents input and feedback on legislation before the General Assembly, hosting numerous town hall meetings, office hours, and issue forums throughout the district. The East Windsor Chamber of Commerce named Rep. Davis the 2016 Business Person of the Year for his community service and advocacy for businesses. 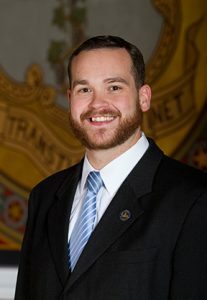 In 2013, Representative Davis was recognized as the Connecticut Car Wash Association Legislator of the Year and was selected for the 40 Under Forty Award by the Hartford Business Journal. In addition to his post in the Connecticut General Assembly, Representative Davis is very active in the community as a member of the East Windsor Society for Detecting Thieves and Robbers and also an active member of Hartford Evergreen Lodge #88 of Ancient Free and Accepted Masons, as well as formerly serving East Windsor Little League as both a coach and umpire and Enfield Hockey Association as a coach. Representative Davis is also a past elected member of the East Windsor Zoning Board of Appeals. He is a former chairman and vice chairman of the East Windsor Republican Town Committee, a former member of the Connecticut Republican State Central Committee representing the communities of East Windsor, Ellington, East Hartford and South Windsor and a current member of the Ellington Republican Town Committee. A product of East Windsor schools from kindergarten through high school graduation, Representative Davis graduated with his Bachelors of Arts and Master of Arts degrees in Political Science from the University of Connecticut. Before his election to the General Assembly, Representative Davis was also pursuing his Ph.D. in Political Science from the University of Connecticut. Representative Davis currently practices real estate, and resides in Ellington with his wife, Emily and daughter.